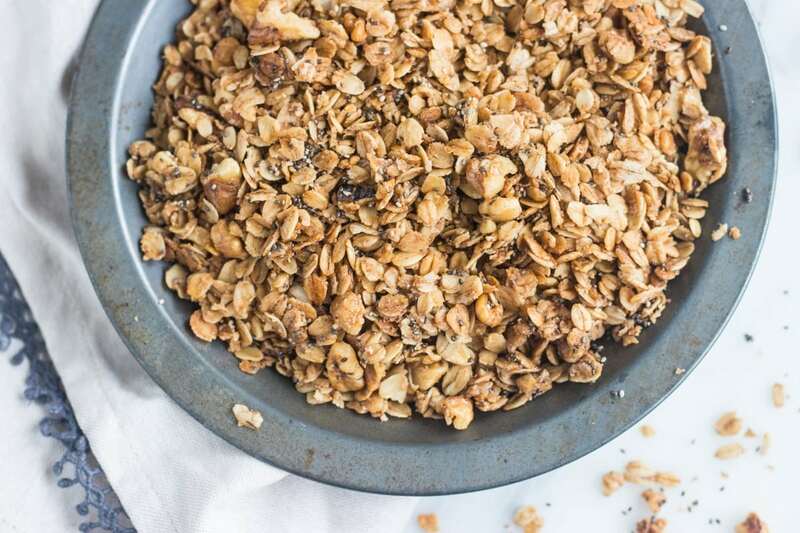 Sweet and crunchy, this Low FODMAP Maple Walnut Granola is a delicious plant-based breakfast or snack. It’s also easily made gluten-free with gluten-free rolled oats. Spring has officially sprung in Minnesota and that means all things home improvement in the Schwartz household. YAY! Over the past couple of years, we’ve been slowly making updates to our starter home to 1) make it more liveable and 2) hopefully increase the resale value. This spring we’re focusing on creating a bathroom in our basement and finishing the inside of our front porch. Now you may be wondering how our home improvement projects and low FODMAP Maple Walnut Granola go together. 🙂 Well, we’re very fortunate that Al’s parents are super knowledgeable in construction. So they have been coming to our house several weekends this spring to help out. Although I’m more than happy to jump in and help DIY when it’s something I can do, my primary job is to keep the team fed. Because my father-in-law has a bit of a sweet tooth, I wanted to create something that was not only low FODMAP but also a little more nutritious while still being sweet. 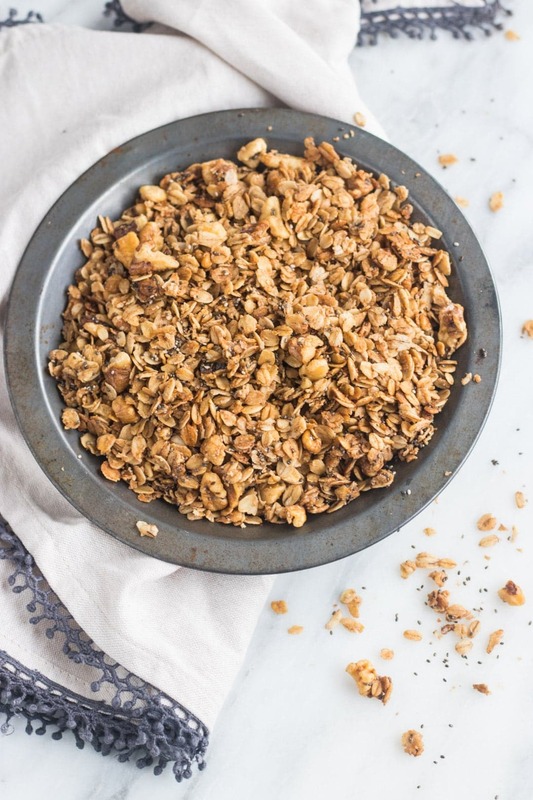 This Low FODMAP Maple Walnut Granola is packed with whole grain (gluten-free) oats, crunchy walnuts filled with plant-based omega-3s and fiber-rich chia seeds. This granola is sweetened with a bit of FODMAP-friendly maple syrup. If it’s too sweet, feel free to adjust the amount to suit your taste preferences. 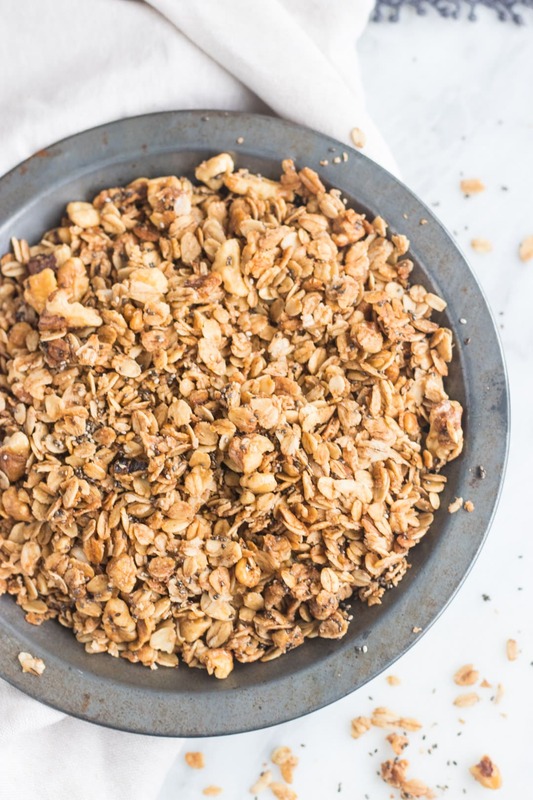 I like to enjoy this Low FODMAP Maple Walnut Granola plain, as a sweet and crunchy snack, or I’ll serve it with unsweetened milk and FODMAP-friendly fruit for a yummy breakfast. In a large bowl whisk together maple syrup, melted coconut oil, and cinnamon. Add oats, walnuts and chia seeds. Stir to mix. Pour mixture onto a lined baking sheet and spread evenly. Stirring every 10 minutes, bake for 30 minutes or granola is crunchy and golden brown. Rolled Oats: A low FODMAP serving is 1/2 cup or 52 grams. An excellent basic low FODMAP granola recipe! I made half the recipe so I wouldn’t feel like I wasted ingredients if I was reactive and couldn’t eat it. Subbed ground flaxseed for the chia seeds and extra virgin olive oil for the coconut oil and baked for 35 minutes. I like a bit of that burnt taste to my granola. I ate 1/4 cup with no issues. Can’t wait to slowly add dried berries and cacao nibs to this later! Thanks for sharing! Thank YOU! Love the idea of adding dried berries and cacao nibs later (as tolerated). Thanks for taking the time to share your thoughts! I made this recipe 2 days ago & loved the taste of it but within 15 min I was in the washroom for the next hour off & on. I don’t understand how things can go through so quickly. At times foods take 2-3 hours to manifest. Hi Shelley, I’m so sorry to hear that your symptoms were triggered. Instead, the act of eating stimulates something called the gastro-colic reflex. This reflex tells the digestive tract to keep things moving along to make more room for incoming food. Because of this reflex, food previously eaten is moved forward into the small intestine or colon where FODMAPS can trigger symptoms and make it feel like something we just ate is triggering our symptoms. 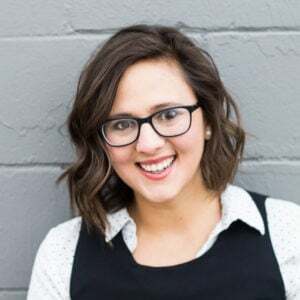 For more info on how long it takes for FODMAPs to trigger symptoms, this is a great summary by a fellow low FODMAP dietitian. Because it takes time for FODMAPs to trigger symptoms, it is often difficult to pinpoint what is actually triggering symptoms. For this reason, we recommend keeping a detailed food and symptom journal and working with a low FODMAP dietitian, if possible. 1) Serving size is important. This recipe contains foods (oats, chia seeds, walnuts) that when eaten in larger servings are no longer considered “low FODMAP”. Sticking to the serving size of this recipe (about a ½ cup) or less is really important, especially if you will be eating it with other foods. 2) Was anything else eaten with the granola (i.e., low FODMAP milk and/or fruit)? 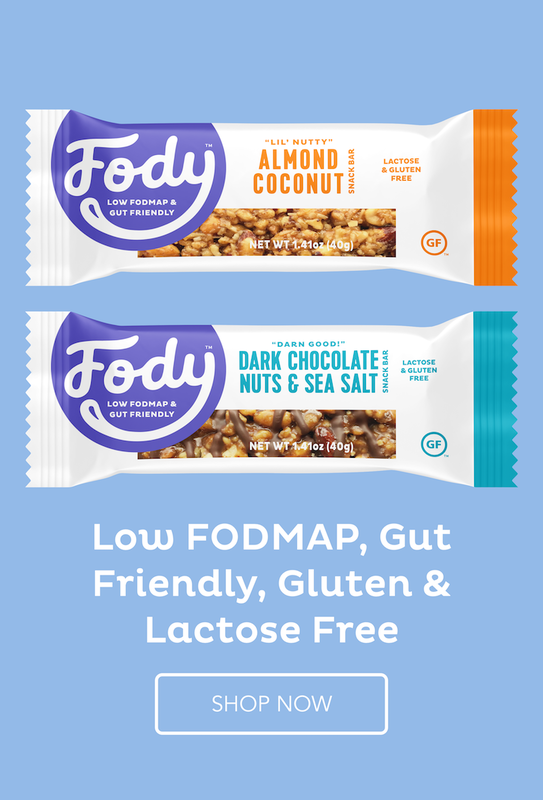 If yes, this may push you over your FODMAP threshold (even if they were eaten in low FODMAP serving sizes) and trigger symptoms. Try to decrease the serving sizes of each. 3) Had it been at least three hours since eating? If no, this may also push you over the threshold and trigger symptoms. The general recommendation is to space meals and snacks at least three hours apart. 4) This recipe is relatively high in fat (coconut oil, chia seeds, and walnuts). Fat, although not a FODMAP, may be a trigger of IBS symptoms in some individuals. Again, decreasing serving size may help.